This posthumous portrait of Whitman by her friend Helen Merriman hangs in the Radcliffe College Room of the Schlesinger Library. The leaves in Whitman's bodice may be laurel, symbols of victory and of artistic achievement. Sarah Wyman Whitman was an original and compelling figure in late nineteenth century Boston. Very much a public personality, she was a painter, a designer of book covers and stained glass, an interior decorator, an author, poet, teacher. The notes she wrote with a quill pen, her style of dress—ostrich feathers, beaver bonnets, exuberant shades of silk and satin, unusual gems—even her exalted manner of speaking (to hide a slight impediment) reflected the ways she had joined her art and her life. Her plans began to take shape two years after she exchanged the dullness of Lowell for the dullness of a long marriage to Boston wool merchant Henry Whitman. With their move to Beacon Hill, she gained access to the wider world of the Boston elite: artists, writers, and educators. In 1868, she entered the studio of the socially prominent and successful artist William Morris Hunt, who had recently begun to welcome women as students. Her professional training was astonishingly brief. She studied with Hunt for three winters, studied drawing with his colleague William Rimmer, and twice—in 1877 and late 1878 or early 1879—went to France to study with Hunt’s former master, Thomas Couture. Although she lacked “just one year in the Academy,” considered a prerequisite for a successful career, she determined to move forward. In a letter to a patron, she described her “plan of life” as balancing a successful professional career amidst her obligations “as a householder,” her philanthropic interests, and her position in society. Even she admitted it was a “strange complex web” of a life. By 1881, one critic already judged her “as representative of successful women-painters in Boston.” But she did not limit herself to accepted feminine subjects: portraiture, still lifes, and landscapes. She turned to the field of design, an approach—encouraged by Couture, echoed in the English Arts and Crafts Movement, and actively supported by her mentor and benefactor, Harvard professor Charles Eliot Norton—that viewed art and life as inseparable. In the 1880s she began to produce a steady stream of designs for book covers, stained glass, and interiors. This work paralleled her career as a designer and creator of stained glass. 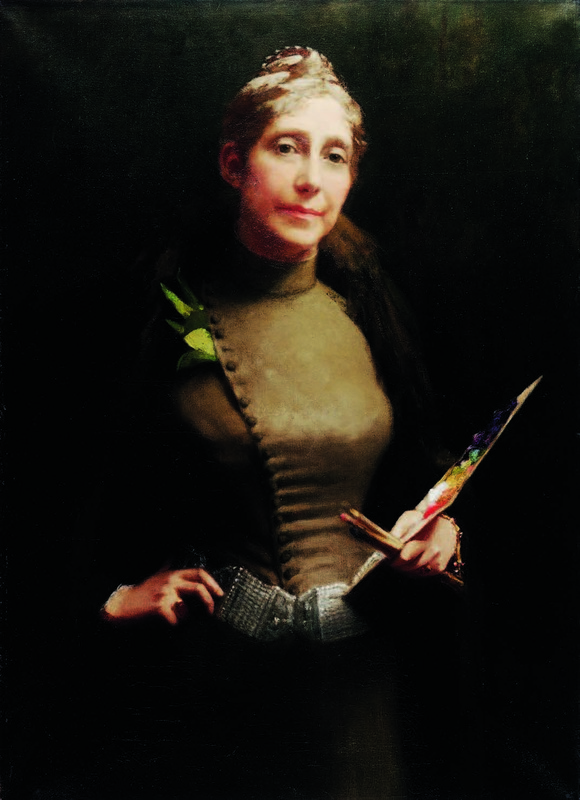 The artist John La Farge, who asked her to create a carpet design as part of his commission to decorate H.H. Richardson’s newly completed Trinity Church in Boston, was a primary influence; her first stained-glass commission, in 1884-85, for the Central Congregational Church in Worcester, Massachusetts, was probably due to his recommendation. She designed 100 windows for Berwick Academy in Maine (Sarah Orne Jewett’s alma mater), the Phillips Brooks Memorial Window in the Trinity Church parish house, and many smaller commissions for churches stretching from New York City to Albany, and along the New England coast from the North Shore to Cranberry Island, Maine. For Harvard’s Memorial Hall she designed both the elaborate south transept window and the Honor and Peace window on the south side of what is now Annenberg Hall. Meanwhile, she continued to draw together people she admired, subtly entwining friendship and patronage, welcoming visitors to enjoy her “all-embracing hospitality” at her city and country homes and her studios on Boylston Street (the Lily Glass Works) and Mount Vernon Street. She exhibited her paintings and lectured occasionally. She taught women’s Bible classes for 30 years, in winter at Trinity Church, in summer on the North Shore. She devoted time and money to innovative educational institutions, among them Tuskegee Institute, Berea College, and the “Harvard Annex,” the new women’s college in Cambridge, whose president was her close friend Elizabeth Cary Agassiz. Fittingly, her last works in glass—the panels Courage, Love, and Patience created for the 1904 St. Louis Exposition—are now installed in the Radcliffe College Room of the Radcliffe Institute’s Schlesinger Library. Betty S. Smith, CAS ’78, is a professional researcher.